Rafi idolises her seventeen-year-old brother, who is popular, generous and a borderline genius. Ever protective, Silas always includes her when he's with his friends, so Rafi gets to hear all sorts of things that younger sisters wouldn't normally be a part of. Like the time Silas hacks a gaming site to help out his friend Josie, who has been trashed by her ex. With Josie, Rafi finds herself with a proper friend for the first time in her life. 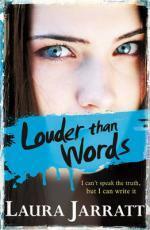 As they grow closer, she realises that she wants to find a way back into the world – she wants to learn to speak again. But Silas has found a new interest too – and it’s taking him away from everything that was once important to him. Can Rafi find the words to save her brother? This book is about dear Rafaela, or Rafi, who has progressive mutism. Progressive mutism and selective mutism are two completely separate things, because in selective, you still speak to your family and realllllyy close friends. Progressive meant she couldn't even talk to her family. So I think she had this for 10 years now? She's 14 so.. yeah. My age! I could connect to her more because this too, as well as because I had something similar to selective for 9 years? it's mostly psychological thoughhh...I thinkk.. Anyways. Although it's not well pooooiiiffeect, I really like Laura's writing ;) The way she wove the story and told them was ingenious too (-the whole email thing with Silas). The characters were believable, although sometimes I wanted to strangle Silas for being so obviously stupid. Shall I go into more details about our characters? Okayy! You're a really good listener, do you know that? I mean, you don't nod all the time and obviously you don't answer, but it's in your eyes that you're listening. And there's something else there too... that you won't judge. She's a 14 year old British gal who aspires to be a writer. I collect truths. I write them down in a book I keep hidden under my bed. I just adored her! She was strong- which I like *winks*- and she wasn't like closed up to people. Oh and I want to do that now.. write down amazing quotes and stick it under my very dusty bedd. Always try to do something awesome at least once a month, that's my motto! Now here's Josie. I think she was my favourite character<3 After an incident with her terrible ex, she meets Silas and Rafi! She helps Rafi in ways no one can describe. - She paused to gulp in a breath. "I should shut up. I talk too much." And me not enough, I thought. Besties alert? Heck yes. Rafi is Josie's only 'real' friend, and Josie is Rafi's only friend! (well apart from her brother, but that doesn't count.) I loved their interaction, and how Josie could tell that Rafi was really best friend material. and guess what! She collects quotes too! Getting one everyday via Pinterest. Silas is Rafi's brotherr! He always looked out for her, and never really fell in love before, until he met Lara. Now Lara is a bit of a more complicated character, and I did NOT like her. I don't get how Silas was just utterly OBSESSED with her after talking to her for less than a minute! Just because she's hot *scoffs* She was so ruuuudeeee too. I think both of them just frustrated me so muchh! Mer. The book tells us how important words and actions are. You can take action! I also liked how it wasn't about Rafi just because she was mute? It was actually about Silas. (Well duhh, since Rafi is writing Silas' story *facepalm*) The topic of the book took an unexpected swerve towards protesters and anarchy! :0 Who would have suspected THAT when they picked this up. War is when your government tells you who the enemy is. Revolution is when you figure it out for yourself. Another message I liked: Don't change yourself for another person. And I loooove this quote for some reason: There is pleasure sure in being mad in which none but madmen know.